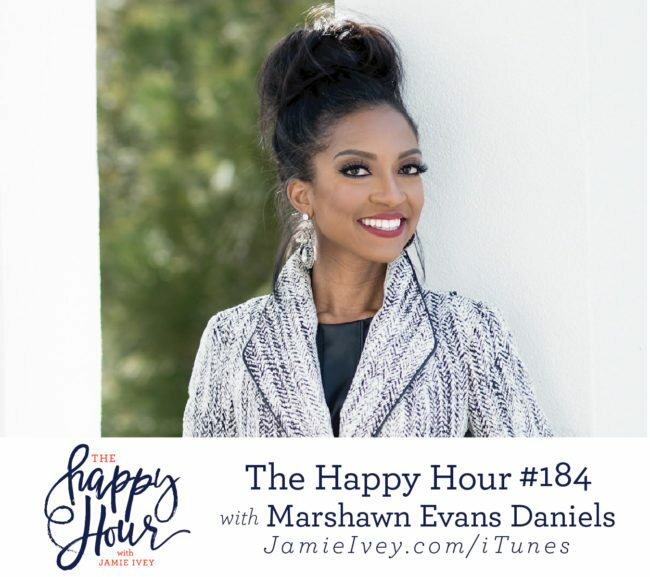 My guest for The Happy Hour # 184 is Marshawn Evans Daniels. A former sports attorney, Miss America finalist, and competitor on The Apprentice, she left a high-powered law firm and turned her passion for people into a multimillion-dollar enterprise. Marshawn is a reinvention strategist and life coach mentoring women to live bolder in the areas of faith and business and turn ideas into income and faith into action. On today's show, Marshawn shares the story of how living out faith in her daily life led her to where she is today, coaching and empowering women. Marshawn tells us about how she competed in Miss America, The Apprentice, and discovered her talent for business. After launching her own book on business and creating a successful sports agency, Marshawn faced crisis: the week she was set to be married, she called off her wedding. Marshawn describes this as her "split rock" moment and that God used this crisis to move her through what she calls divine reinvention. I know that Marshawn inspired me when she said that we should all believe bigger and be awakened in boldness to use the gifts that God has given us, and I hope that you are inspired too! A note about our conversation today: you may want to be aware of little ears that are listening when Marshawn and I discuss the topic of infidelity. Happy Hour Live! Event Tickets On Sale Now!